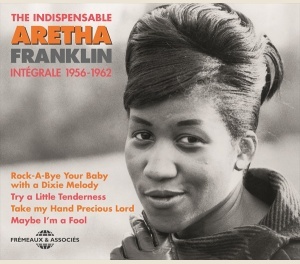 GOSPEL - ARETHA FRANKLIN THE INDISPENSABLE - FA5735 – Frémeaux & Associés. Aretha Franklin was the Queen of Soul and probably much more: the Queen of American singers, a much- disputed title her impressive discography can easily claim. This double album includes the first six years of her recordings, going forward from her beginnings as an exceptionally gifted gospel singer aged fourteen. She went on to become one of the most extraordinary vocalists in music history, thanks to the intensity of astounding recordings like “Today I Sing the Blues” or “Maybe I’m a Fool.” Bruno Blum tells her story.